Home > Shop by Brand > Pinnacle Natural Brilliance > Pinnacle Black Label Collection > Pinnacle Black Label Surface Cleansing Polish 32 oz. Rare and precious elements, such sea-born pearls and sparkling gemstones require pure, near-perfect environments to form. A hint of contamination and a flawless diamond will remain coal. 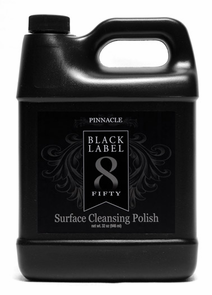 Pinnacle Black Label Surface Cleansing Polish deep cleans and prepares the surface, creating the perfect environment for Black Label Diamond Coatings to crystallize a into highly-reflective, gem-like shields of protection with unmatched purity. What is standing between you and the flawless finish you desire? Nearly everything. The air is full of pollutants which attach above and below your paint's surface. Your wheels are coated in a shower of red hot iron splinters with just a touch of the brake pedal. Exhaust and oil spray will coat your windshield in a stubborn film that can penetrate the microscopic pores of glass. Pinnacle Black Label Surface Cleansing Polish is the cleansing lotion that Mother Nature wishes she had. Pinnacle Black Label Surface Cleansing Polish in a non-abrasive, gentle cleansing polish that removes all below-the-surface- foreign contaminates, oils, build up wax, and impurities from any hard surface. This creates the perfect environment for Pinnacle Black Label Coatings to transform into dazzling surface coatings with unmatched brilliance and rock-hard protection. Pinnacle Black Label Surface Cleansing Polish is safe and ideal for any paint type, chrome, polished aluminum, glass, any wheel finish, and more. As you apply Pinnacle Black Label Surface Cleansing Polish to the surface, the combination of non-abrasive cleaning agents and nano cleansers penetrate below the surface to safely remove any impurities. Wax, oil, grease, dead and oxidized paint, fallout and more are quickly removed. Pinnacle Black Label Surface Cleansing Polish wipes away completely revealing a pure surface with an unmatched natural shine. Wash and dry your automobile thoroughly. Use detailing clay to remove any above-the-surface contamination and machine polish to remove paint defects. You can apply Black Label Surface Cleansing Polish by hand with a foam or microfiber applicator, or by dual-action polisher using medium speed and a soft finishing pad. Work into the surface in overlapping passes and remove using a soft microfiber towel.